For the past 15 years, Diana Rodgers has lived on a working organic farm raising vegetables and pasture-based animals. In 2010, she realized the solution to her Celiac Disease and blood sugar roller coaster was to eat an ancestral-type diet. From there, she decided to change her career in order to help others through diet and lifestyle change. Today, Diana is a Registered Dietitian with a busy clinical practice and the author of two best selling books. Still, she found she wanted to do more… something BIG! Through her writing and podcast, Sustainable Dish, Diana has been exploring the intersection of the foods we eat and how they’re produced. Along the way, she helped produce a short film, Soft Slaughter, which won a Real Food Media award. Most recently, Diana has teamed up with Myna Joseph, an independent filmmaker whose family started Maple Hill Creamery, a 100% grass-fed organic dairy company, to make Kale vs. Cow. Myna’s previous film pursuits on the subject of food culture include “Pressure Cooker,” an Emmy-nominated documentary released by Participant Media. Myna is fully engaged with the nutritional, environmental and ethical questions at the heart of this story. We recently chatted with Diana about how “Kale vs. Cow” came to be and to hear about how production on the film is coming along. What was the inspiration for “Kale vs. Cow” ? I live on a working organic farm outside of Boston with my husband and two kids, and I have a busy nutrition practice, blog, and podcast. I’ve always been interested in food and farming. In my mid-30s, after a career in food marketing, I decided to become a dietitian. There was a strong vegetarian undercurrent among my professors, and I knew there was a need for an advocate for ‘better meat.’ Not all meat is factory-farmed, treated inhumanely, and cancerous, yet we never learned about sustainability issues during the coursework to become a Registered Dietitian. I’m passionate about humane handling and I’m on the board of Animal Welfare Approved. Red meat is quite a nutrient-dense food, and well-managed cattle are one of our best chances at reversing climate change. There’s a big difference between factory-farmed meat and well-raised meat, yet you would never know this from some of the recent anti-meat documentaries out there. The media has really attacked cows as a major cause of climate change and human disease, and many people feel that it’s unethical to eat them. I’ve seen some pretty outrageous health claims in recent documentaries, such as that meat causes diabetes and that sugar is just fine. Anyone with some basic understanding of science and human metabolism can tell you this is just false information. I think it’s time to defend meat and debunk these illogical arguments. I decided to move forward with my own film project to explain that meat is not necessarily as bad as many like to think. I understand sustainable food production and human nutrition, plus, I have a background in multimedia production; this project was a natural fit! What documentaries, covering a similar topic, were inspirational to you? I was not really inspired as much as I felt “compelled” to produce a thoughtful “other side of the story” to all of the anti-meat films flooding the internet and movie houses these days. The style will be similar to “Chef’s Table,” focusing on personal stories rather than a “talking heads” type of documentary. How did you come to form a partnership with your production partner on this film? I interviewed a bunch of directors but really felt that Myna Joseph had the best life experience (her family started Maple Hill Creamery, a 100% grass-fed, organic dairy company) and artistic vision to help me tell the right story. What is the central message or theme you hope to communicate through the film? Humans are nature. We’re part of the food web. The film will illustrate that everything eats and is eaten. All living things—plants and animals—are interdependent on each other. 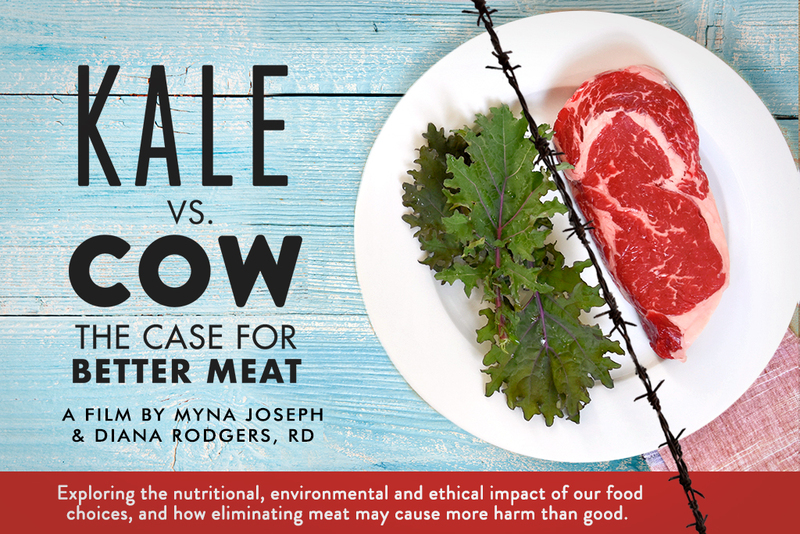 The farming of plants is not inherently better nor does it cause less harm than animal production, and, in fact, removing animals from our food system may cause more harm than good. I don’t advocate for factory farming; clearly this is wrong. But I also discourage industrial-scale monocropping and production of processed foods, which are incredibly destructive. There are quite a few documentaries out there showing only one side of animal farming as “unethical” and claiming meat causes things like diabetes – anyone with some basic understanding of human physiology will know that meat can’t do that, but they’re showing these films at public schools. Humans are omnivores, meat is important to human health, and animals can be raised well. There are not any films showing this side of the story, and I feel it’s critical to get this information out there. What has been the most challenging aspect of making the film thus far? How did you come to know about Filmmakers Collaborative? My friend Kristin Canty made a documentary called Farmaggedon and highly recommended I use Sandra Forman as my lawyer. Sandra recommended Filmmakers Collaborative. I interviewed a few fiscal sponsors and felt that the team at FC would be the most supportive match for me as a new filmmaker.